It’s time for another Tuesday’s Tip from a Dream Makers Travel Agency vacation planner! 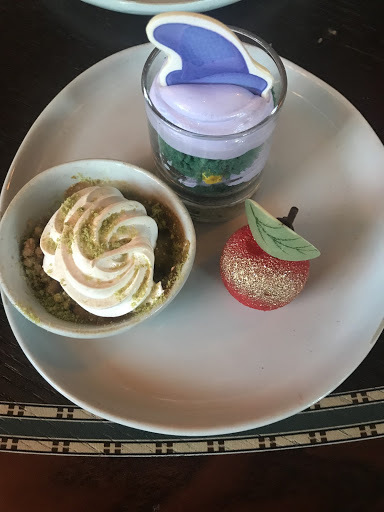 This week Christine Maritz reviews the Storybook Dining at Disney’s Wilderness Lodge. 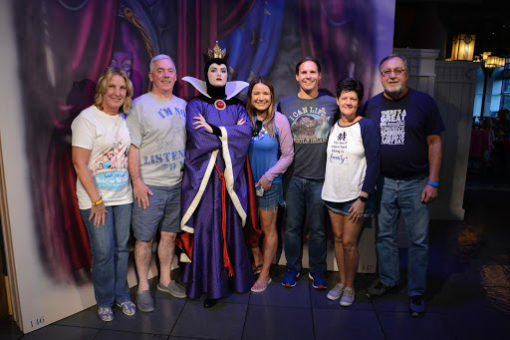 Christine travels to Disney World often. She’s also done multiple runDisney events. She’s run the Wine & Dine, multiple races during Marathon Weekend, and even completed the Coast to Coast Challenge with the Dumbo Double Dare. Without further ado, here is Christine’s tip for this week! 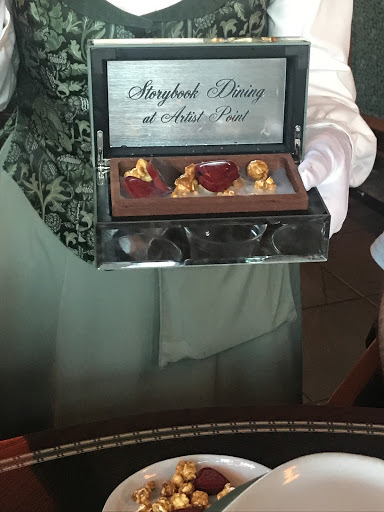 When advanced reservations opened for this dining experience, I booked it right away for our trip during Marathon Weekend! We had a party of 7 adults, and had an early dinner reservation at 4:45. Upon arrival, we were told numerous times that this was a 1 hour dining experience. We were told this by the Cast Member who checked us in, our hostess and our waitress. 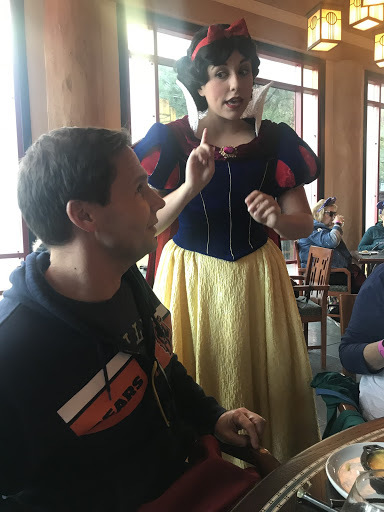 We were curious how rushed we would feel but also were relieved that we would not have to sit around waiting to meet each character for an extended period of time. The room wasn’t much different from what I remembered the previous dining experience, Artist Point, to be. They added glimmering lights and music when each character arrived and also a backdrop for photo opportunities with the Queen. The first course of appetizers was brought out right after we ordered our cocktails. The winter squash bisque was the favorite at the table!! The Hunter’s Pie and the Wicked Shrimp Cocktail got mixed reviews. 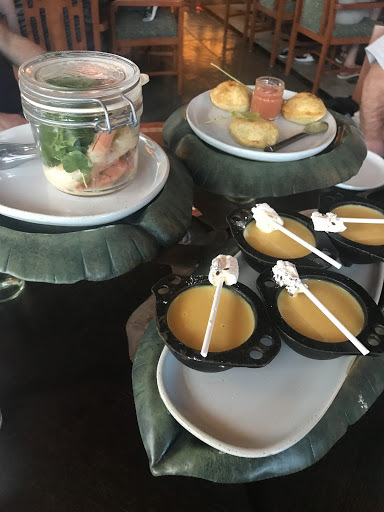 I personally loved the bisque, liked the shrimp, and could do without the pie. I thought the pie was a little dry and I didn’t love the dipping sauce it came with. Even though the appetizers were “shared,” everyone got their own individual portion. 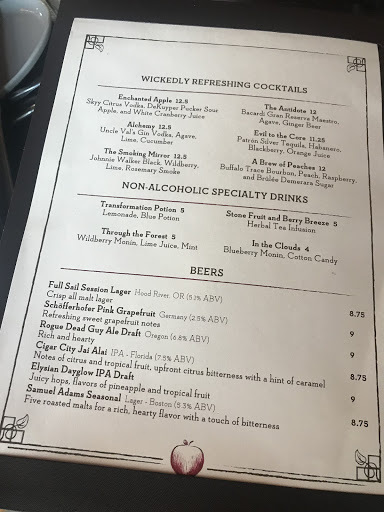 The cocktail list was fun. We got The Smoking Mirror, which is Johnny Walker Black, Wildberry, Lime, & Rosemary Smoke. The glass came out upside down on a piece of wood filled with smoke. The waitress turned it over and then filled the smoke filled glass with the cocktail. It was delicious! 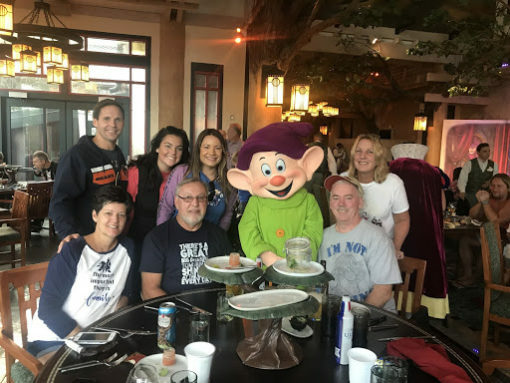 In between appetizers and our meal, Snow White and Dopey visited our table. Dinner came soon after and between the 7 of us, we chose 3 of the menu items. Four of us got the Royal Prime Rib Roast. This dish came with Horseradish Mashed Potato, Hay Smoked Carrots, a Popover, & Au Jus. It was delicious. It was a big piece of prime rib, and everything was delicious. 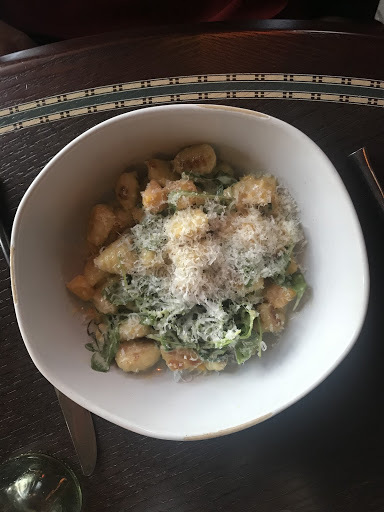 Two of us got A Stroll Through Nature, which was butternut squash, arugula, gnocchi, sage and Parmesan. This was also very good. 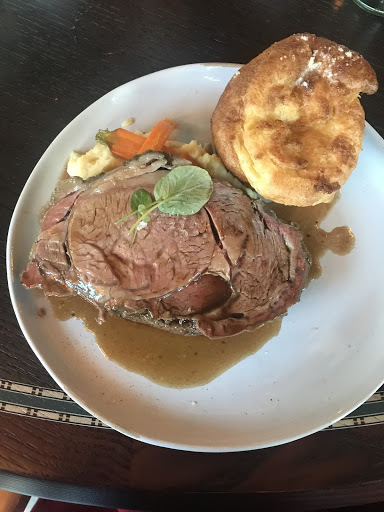 It seemed to be a smaller portion than the prime rib, so if you are hungry, I wouldn’t get this even though it tasted great! 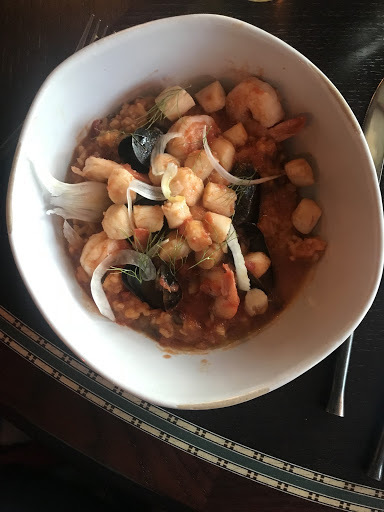 The last dish ordered was Cottage Seafood Stew. This was shrimp, bay scallops, mussels, tomato, and fennel. The seafood was of good quality and the broth was yummy. We wished there was a bread that came with the dinner to dip into the sauce. Before dessert came, Grumpy visited our table. In order to meet the Evil Queen, you must get up and get in line for her. This only took a few moments and by the time we were finished, dessert was being served. Dessert was shared just like the appetizers. Each person received one of each. The Dopey themed dessert, Miner’s Treasures, was sponge cake, chocolate gems, and buttercream icing. It tasted just like any other cupcake you could find in the parks. The Fairy Tale Gooseberry Pie was a meringue with gooseberry, which had almost a tart taste to it. 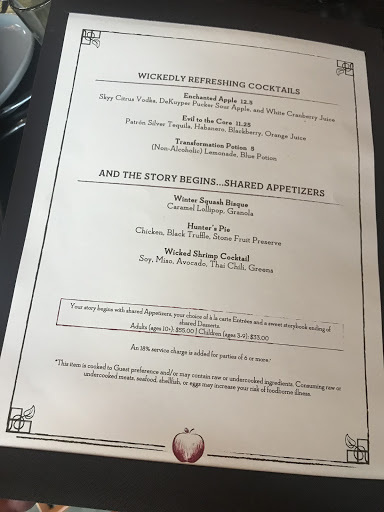 My favorite was the “Poison” Apple. It was a white chocolate-apple mousse with a sour center. It tasted like a cheesecake to me and was beautiful and delicious. Our waitress also brought over The Hunter’s Gift to the Queen. 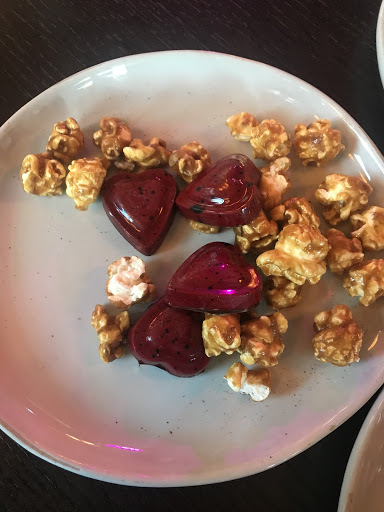 This was cracked maple popcorn with a ganache heart, I also liked this. The ganache heart was also beautiful and delicious!! Overall, this was a great dining experience. Even though they said it was only an hour long, it did not feel rushed. We had just enough time for everything. 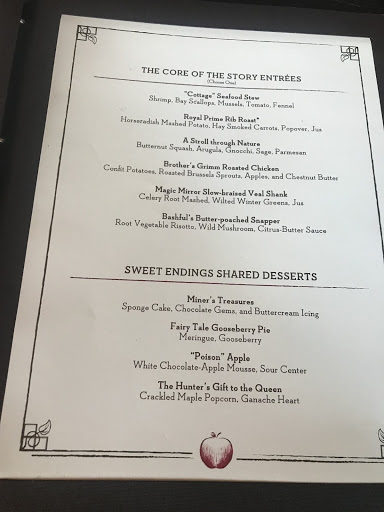 For $55 a person, I thought it was a great meal with great character experiences and I would highly recommend everyone tries it at least once!!! 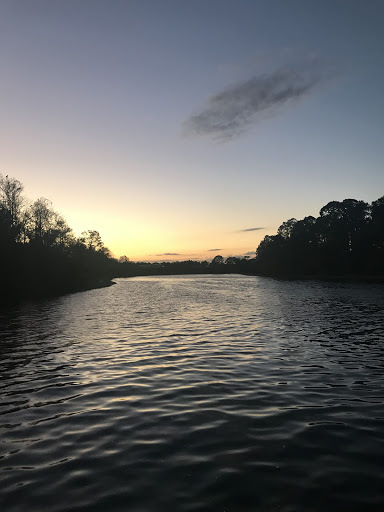 The sweetest ending to this experience was the beautiful sunset we saw while waiting for our boat back to the Magic Kingdom! Thanks for the review Christine! This is on my list of new things to try and thanks to all of Christine’s great pictures I’m really excited to try it! This character dining experience is still fairly new, so reservations will probably be popular for a while. If you would like to contact Christine for help planning your Disney vacation you can find her on Facebook and on the Dream Makers Travel Agency website. 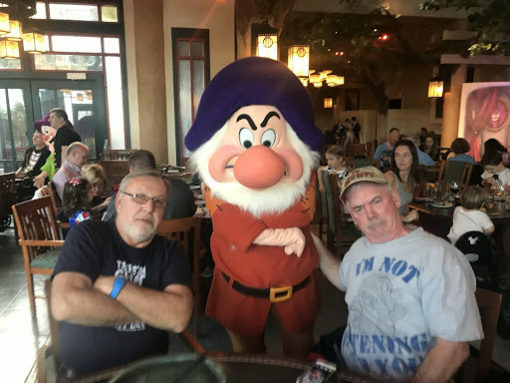 Have you tried this new character dining experience yet? Sounds great & looks delicious! I just read your review on storybook dinning. Sounded like it was a great dinner to go to. We are family of 5 going in late September and it is on our go to list. Thanks for sharing all the great info hope we can get in.